One of the bright milestones toward the development of a vibrant biodefense vaccine industry was the passage of the Project BioShield Act of 2004. That statute was designed "to provide protections and countermeasures against chemical, radiological, or nuclear agents that may be used in a terrorist attack against the United States". 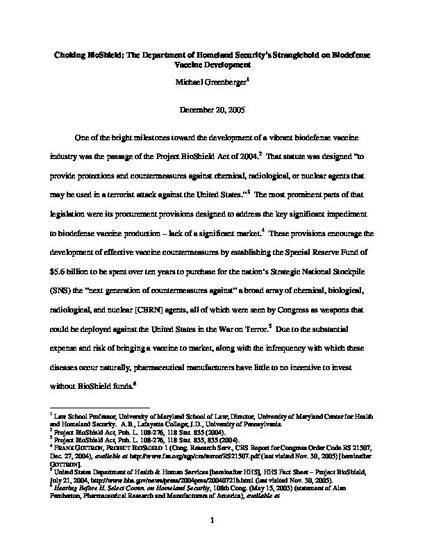 It encourages the development of effective countermeasures by establishing the Special Reserve Fund of $5.6 billion to be spent over ten years to assure pharmaceutical and biotechnology manufacturers that there is a ready market for their products through purchases by the government for the Strategic National Stockpile. The Act was intended to stimulate the "next generation of countermeasures against" a broad array of chemical, biological, radiological, and nuclear (CBRN) agents, all of which were seen by Congress as weapons that could be deployed against the United States in the War on Terror. Unfortunately, implementation of the act has been plagued by bureaucratic ineptness. The foremost example of that failure arises from the fact that the Special Reserve Fund can only be used to purchase countermeasures addressed to biopathogens or toxins which have been found to "present a material threat against the United States" as determined by the Department of Homeland Security (DHS). Employing an opaque, bureaucratized, lengthy process for determining material threats, DHS has to date only recognized four CBRN threats despite the fact that for years other branches of the government, including the Department of Health and Human Services and the Department of Defense, have recognized dozens of these threats. Accordingly, the Special Reserve Fund cannot be used to purchase countermeasures which address many likely terrorist biological and chemical weapons, and the purposes of the Act have been severely undercut.